One of my favorite pieces in Fiesta was the 2-cup tea pot. I wish I would have purchased more of them, because they’re perfect for days when I want tea but not a whole lot of it. 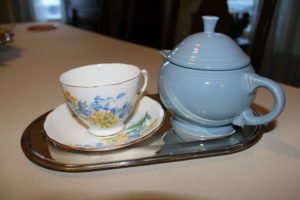 The one I have is in my favorite Periwinkle Blue color, and it goes great with a tea cup and saucer by Royal Vale given to me years ago by a friend for my birthday. My Periwinkle Blue 2-cup Fiesta tea pot and Royal Vale tea cup and saucer-a great little pick-me-up on a cold winter’s day!